Mix the paneer with black pepper powder, salt and cornmeal. shallow or deep fry until done. overfry not the paneer can be difficult. since we cornflour coat you will not see that golden paneer. should not continue to make fried golden brown. Paneer become difficult. Sesame oil heat. Now add the onions / shallots and sauté until they become transparent. Add the ginger, garlic and saute until the smell disappears first. Add peppers and green peppers and sauté until the pepper is half cooked. Add crushed black pepper and pepper Schezuan. Pour the vegetable broth or water.Add celery and stir. Add soy sauce, sugar, black pepper, red chili powder and salt. Simmer. Add the paste of corn flour. Stir well and allow to thicken the sauce. Add fried paneer cubes and simmer in the sauce for 1-2 minutes. 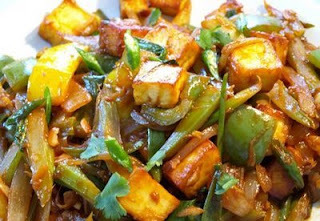 Garnish with green onions and serve hot spring with chilli paneer vegetables fried rice.